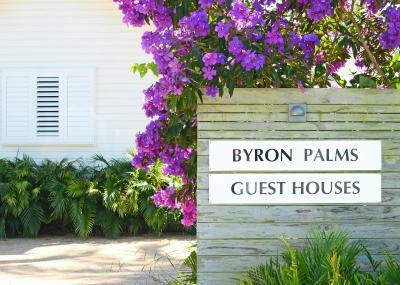 Lock in a great price for Byron Palms Guesthouse – rated 9 by recent guests! The staff and the owner especially were extremely friendly and definitely knew how to make you feel you are at home! Absolutely STUNNING property, all the staff were amazing.. 10/10 recommend for anyone looking for a beautiful place to stay in Byron! The setup is great, very laid back and gets you to mingle with the other friendly guests. The staff was very friendly and we had a great stay. Great location, near all the restaurants and shops. Had a really nice pool and outdoor area. Fantastic setting and great functional rooms. The staff were very helpful and I had a great stay. Thank you. What a beautiful little cottage. The staff were extremely friendly and the Cottage had everything you could ever need. 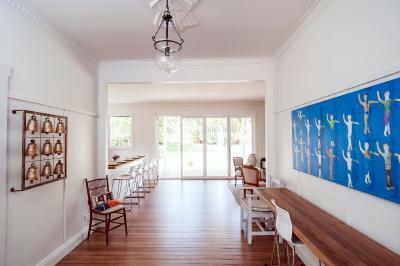 Only a short 10 minute walk to the main streets of Byron. Nice relaxed vibe to the place, friendly staff, clean and well run. The staff at the guest house we're extremely welcoming and seemed genuinely happy to have us stay. All interactions with staff we're very warm and friendly. Byron Palms Guesthouse This rating is a reflection of how the property compares to the industry standard when it comes to price, facilities and services available. It's based on a self-evaluation by the property. Use this rating to help choose your stay! One of our best sellers in Byron Bay! 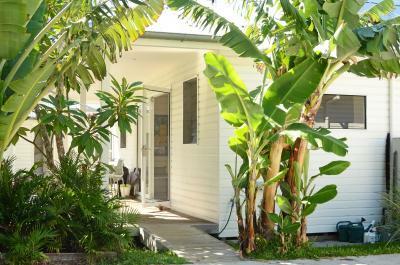 Offering free breakfast, on-site parking and free WiFi, Byron Palms Guest house is a 10-minute walk from Byron Bay main beach. Guests can relax and enjoy the garden and deck areas, and make use of the shared lounge and kitchen areas. The accommodations includes rooms and studios featuring a flat-screen TV, fresh towels and bed linen with either an private bathroom or private bathroom with free toiletries. The town center of Byron Bay is just a short walk away from Byron Palms Guest house, where you will find restaurants, cafes, supermarkets and shopping. The property is a 5-minute drive from Byron Bay Golf Course and Cape Byron Lighthouse, the most easterly point on the Australian mainland. Ballina Byron Gateway Airport is a 30-minute drive away. 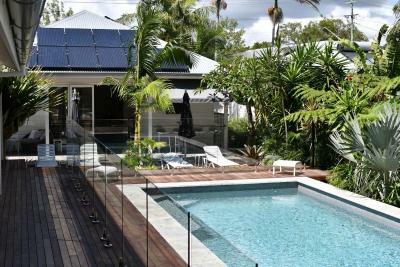 뀐 Located in the top-rated area in Byron Bay, this property has an excellent location score of 8.9! When would you like to stay at Byron Palms Guesthouse? This air-conditioned room includes a flat-screen TV. There is also fresh towels supplied daily and comfortable linen. The private bathroom has a shower and free toiletries. This air-conditioned room includes a flat-screen TV. There is also fresh towels supplied daily, and comfortable linen. The private bathroom has a shower and free toiletries. This air-conditioned room includes a flat-screen TV. 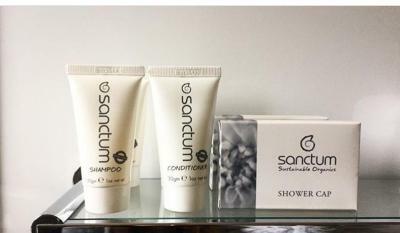 There is also fresh towels supplied daily, and comfortable linen. The private bathroom has a disability access toilet and shower plus free toiletries. The separate private bathroom, which is accessed by the hallway, has a shower and free toiletries.This air-conditioned room includes a flat-screen TV. There is also fresh towels supplied daily, and comfortable linen. Please note that the bathroom is located separately from the room, down the hallway. It is for the private use of guests in this room. House Rules Byron Palms Guesthouse takes special requests – add in the next step! Byron Palms Guesthouse accepts these cards and reserves the right to temporarily hold an amount prior to arrival. Please note that Byron Palms Guest house does not accept payments with Diners Club credit cards. If you expect to arrive outside reception opening hours, please inform Byron Palms Guest house in advance, using the contact details found on the booking confirmation. Please inform Byron Palms Guesthouse of your expected arrival time in advance. You can use the Special Requests box when booking, or contact the property directly using the contact details in your confirmation. More space to hang clothes or chest of drawers, great hit one or maybe 2 nights but would be s but difficult longer term. Room was quite small and might be a little claustrophobic after s couple of days. Beautiful house and tastefully decorated. Friendly staff, good breakfast. Breakfast did not start until 8.30am, far too late for us, noisy, small room with difficult window to open, not very private. Clean, in good condition close to CBD and Beach. I can see why a lot of people like it (it really looks nice), but it did not work for me. Location is okay-ish - 15min walk to the main beach, roughly 30min to Tallow or the Pass, short walk to the supermarket. But close to a road - I'm a light sleeper and was up at 6am when the traffic started to pick-up. Breakfast was not really refilled if you came late. Nobody around for the check-in. The interior has this Ikea-chic - I liked it. the design and layout of the whole place loved the modern look of it all and the gardens and pool it’s perfect, we also got a free room upgrade when we turned up which was amazing and so unexpected!! waking up in the morning to breakfast served on the kitchen bench was amazing!! We only live in lismore so don’t need to book anywhere to stay in byron usually but i will 100% be returning if i need to in the future!! Although we arrived at noon we were not even received by the reception staff. They just left the key at the entrance and a piece of paper with all instructions. A bit impersonal treatment in my opinion. Very new guest house. Everything clean and comfortable. Well decorated. Our room was very small, it felt a bit boxie, although the charm of the property is that it feels like home, it also slightly has the feel that your living with roommates and hiding in your tiny room. The pool is beautiful and property has a very homely feel. The breakfast was also really nice and you could just help yourself. Overall the property had a really nice feel for very affordable price. A little expensive but overall nice facility! Nice breakfast spread, gf/df options availble too and fresh fruit! Checked in late, and was Confusing as had no idea we had to get our key from a pin board where there was no light to see it. The bathroom clearly hadn’t been cleaned as dirty toilet and still towels in the dryer from previous guests. Location was good, beds were comfy. The ‘byron’ feel in the style of rooms and garden. Very comfortable bed with lovely linen. Friendly staff, beautiful breakfast, lovely pool and sensational gardens. Quiet yet close to everything you need. Kitchen needs a microwave. We had left overs and had to leave them behind because we couldn’t reheat. Hate to waste so much food. Great location. Nice modern feel. Free reign of kitchen meant you could take it easy and have a light tasty brekky and a cuppa whenever you wanted.